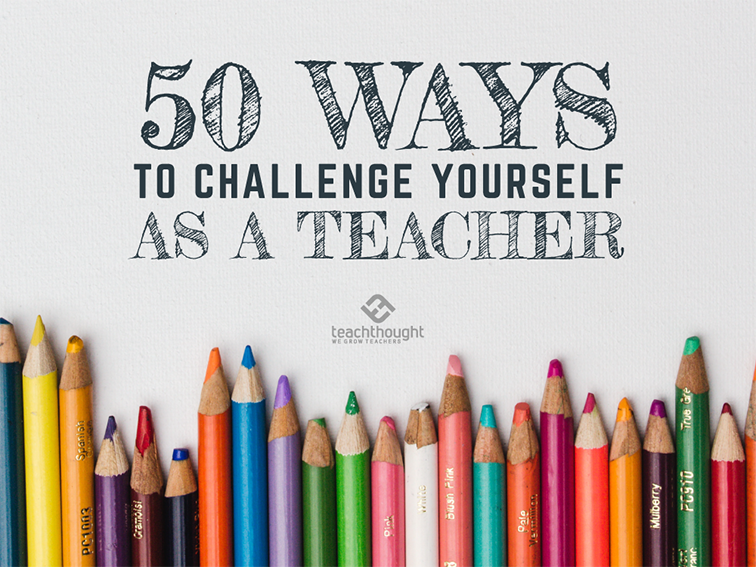 Growing as a teacher is all about challenging yourself–moving out of our comfort zone, trying something new. 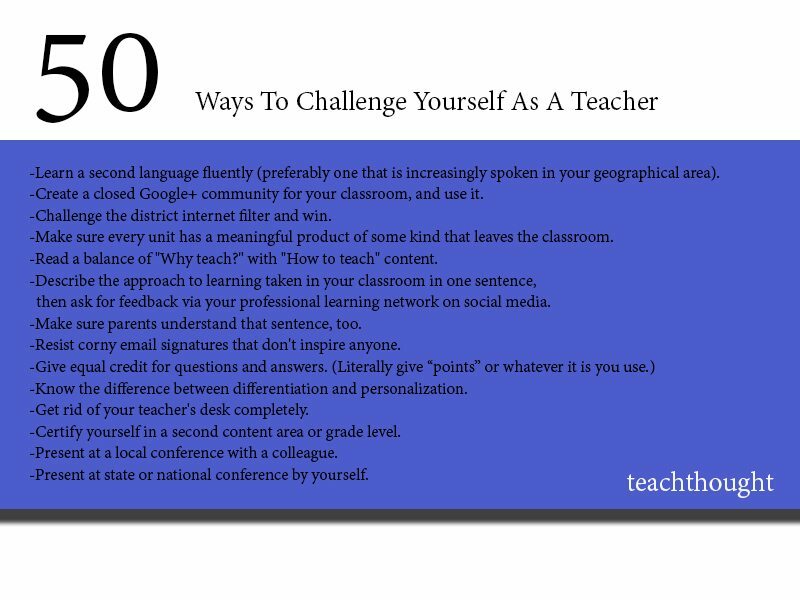 Here are 50 ideas to consider. Learn a second language fluently (preferably one that is increasingly spoken in your geographical area). Create a closed social media community for your classroom–then use it. Challenge the district internet filter and win. Make sure every unit has a meaningful product of some kind that leaves the classroom. Read a balance of “Why teach?” with “How to teach” content. Describe the approach to learning taken in your classroom in one sentence, then ask for feedback via your professional learning network on social media. Make sure parents understand that sentence, too. Resist corny email signatures that don’t inspire anyone. Know the difference between differentiation and personalization. Get rid of your teacher’s desk completely. Certify yourself in a second content area or grade level. Present at a local conference with a colleague. Present at state or national conference. Create a syllabus that’s actually useful to parents and students. Ensure that every single assignment is accessible to every single student in terms of reading level, background knowledge, and technology access. Read a book on education that seems to reflect the opposite of what you believe. Reach out to every single parent/family of students and create an authentic reason for them to visit your classroom this year. Connect every student with a mentor in the community. Laugh with your students, even if you have to play stand-up comedy. Have students record and curate the audio from every single group assignment. Smile at every student, every day. Or greet them at the door with a cool handshake. Assign optional homework every night; encourage those that need the practice to do it and those that don’t to create their own. Stay at home when you’re sick. Use sentence stems that reflect critical thinking so your students will, too. Make sure students talk more to one another than they do to you during discussions. Throw out all of your lessons and units and start over from scratch. Read to your students (e.g., from a picture book or poem) at least 10 minutes per week no matter your grade level or content area. Co-create all rubrics with students. Make it cool to read in your classroom. For every idea you disagree with while discussing ‘education,’ present a rational counterargument or solution. Every time you correct a student, do so with a positive presupposition that’s authentic. Be honest at staff meetings. Run a book drive in the school’s community. Find the line between holding yourself accountable without beating yourself up. Memorize your academic ‘power standards’ verbatim. Then create competencies for each power standard, and know those verbatim too. Create a lesson where you don’t say a single word. Refuse to serve on school committees that are functionally worthless. Videotape yourself teaching and share it with the world. Learn the exact differences between the academic standards from the year prior to the one you teach, and the one after. Make sure parents understand your grading policy.